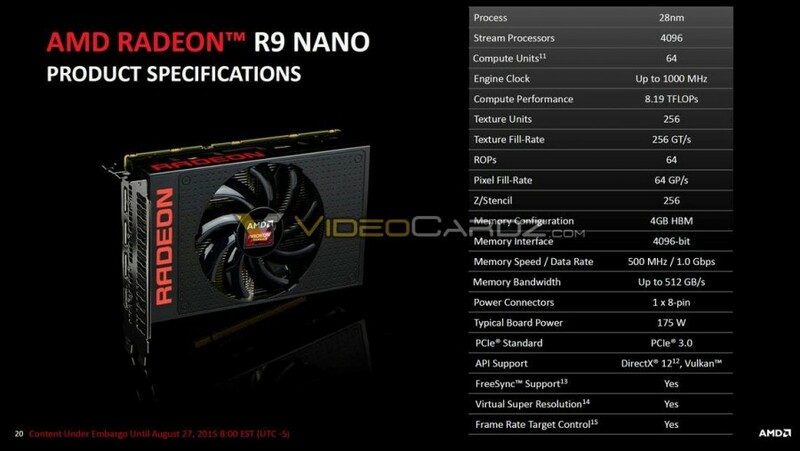 AMD will unveil their latest Radeon R9 Nano graphics card on 27th August but Videocardz has shared the final specifications for the most powerful Mini-ITX graphics card from AMD. Based on the AMD’s Fiji GCN GPU core architecture, the Radeon R9 Nano will come with great performance and a compact design geared towards Mini-ITX solution. Now we certainly can’t talk about performance figures at the moment but we can tell you the exact specifications featured underneath the hood of AMD’s R9 Nano graphics card. 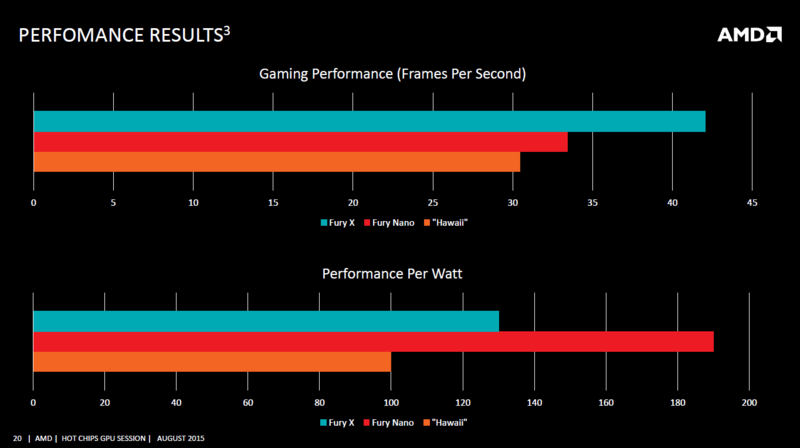 As the older posts said, the Radeon R9 Nano is based on the full fat Fiji GPU core. The design is by no means cut down and its amazing how the Fiji GPU runs so well on a design this compact. Based on the 28nm HPX process, the Radeon R9 Nano features 64 compute units which have 64 stream processors per CU, these round up to a total of 4096 stream processors which is the same core count featured on the flagship R9 Fury X graphics card. The card comes with 256 texture mapping units and 64 raster operation units. While the Radeon R9 Fury X has a compute performance of 8.6 TFlops with its 1050 MHz engine clock, the Radeon R9 Nano comes with a total compute performance of 8.19 TFlops with its 1000 MHz engine clock. The 1000 MHz clock speed for the Radeon R9 Nano is quite impressive indeed as this package as a whole is 175 Watts that is 100W less than the Radeon R9 Fury X (275W). The Radeon R9 Nano is designed to feature greater performance efficiency numbers compared to both Radeon R9 290X and the Radeon R9 Fury X which it achieve with ease. Now here’s the scene, the Radeon R9 Nano has a total board power that is limited to 175W, pumped through a single 8-Pin connector. The GPU isn’t necessarily working at 1000 MHz all the time, the core clock can be optimized based on the needs of applications and games. For memory, the card will feature the 4 GB HBM architecture that is found on all Fiji based cards. The 4 GB HBM will be working at 500 MHz (1.00 GHz effective) clock rate that will be featured across a 4096-bit wide memory interface that pushes out 512 GB/s bandwidth. The HBM can be seen as one of the major reasons for the R9 Nano being so compact in design and having better performance per watt as HBM saves a good room of power requirements and space compared to traditional GDDR5 memory based cards. The card will be fully compatible with AMD technologies that include Freesync, VSR, Frame Target Control and fully support the DirectX 12 API which is a really good reason for everyone to be upgrading to newer cards with DX12 support underneath the hood. The design scheme of the Radeon R9 Nano was talked by us yesterday, you can take a look for yourself here. There is a lot more information which we will be showing you in the days ahead on AMD’s latest Radeon R9 Nano graphics card and its fantastic gaming performance packed inside its compact design. 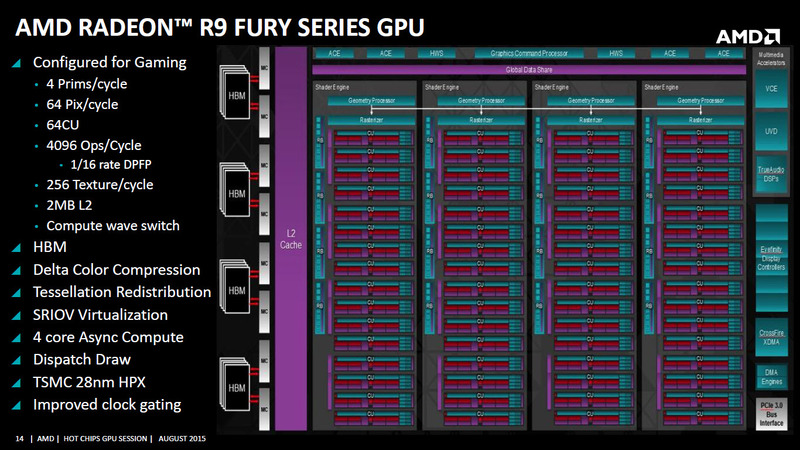 The R9 Nano will become the fastest Mini-ITX graphics card on the planet.